Trends UD-10 Lite USB Audio Converter and Headphone for the audiophile ! Use the Headphone connects with Trends UD-10 Lite USB Audio Converter! 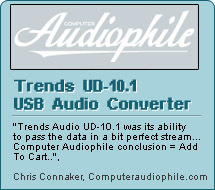 Trends UD-10.1 USB Audio Converter as a Headphone amp. Trends UD-10.1 with the Desktop PC as a high end headphone amp. Trends UD-10.1 with Notebook & AV receiver.